This recipe serves one large Gin Daisy or 2 in martini glasses. 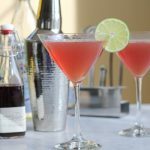 Shake the gin, fresh lemon or lime juice, and grenadine with the ice; then strain (equally) into chilled glasses. Add the sparkling water to fill. Garnish with a lemon or lime slice.